It was right after I took this photo that things started going to hell. 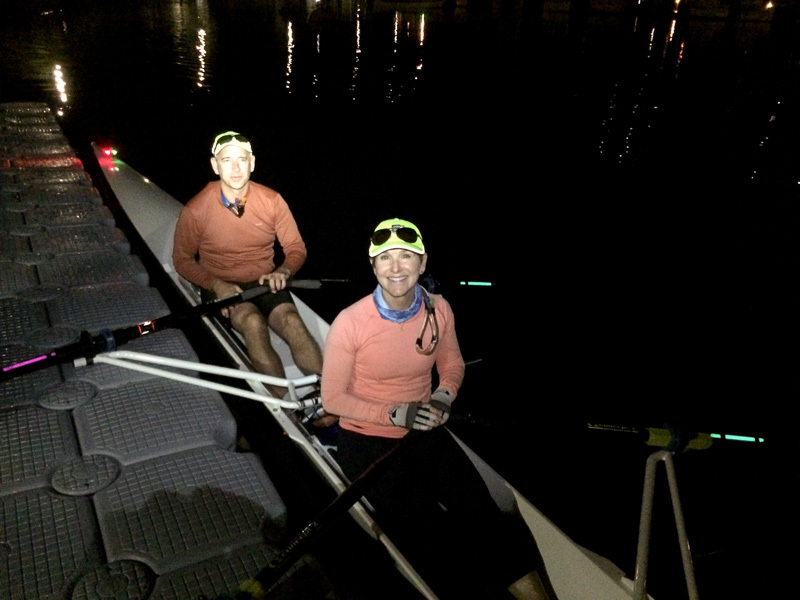 Stefan and I were rowing the Monterey Bay Crossing, a roughly 26-mile race from Santa Cruz to Monterey Bay. We were an hour into it, cruising along, and on track for our goal of a three-hour-plus-change finish. 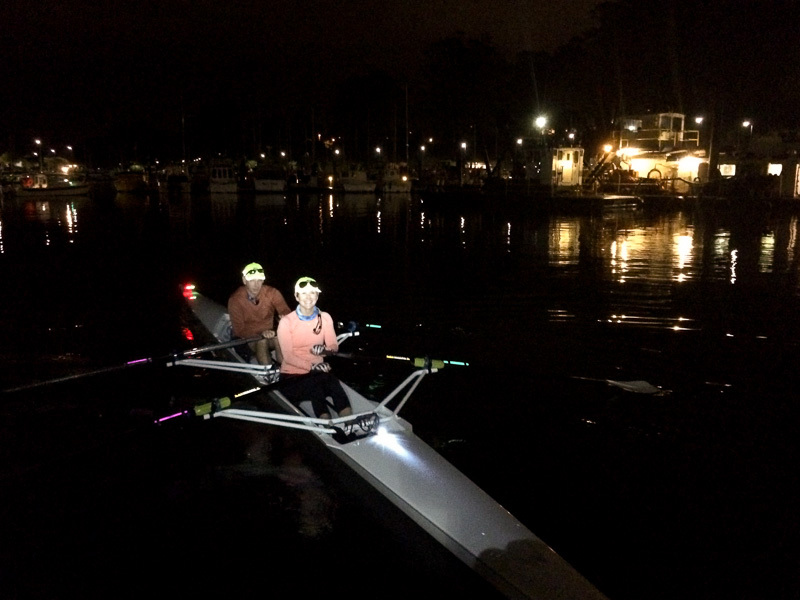 In fact, we'd just rowed the equivalent of our regular Golden Gate outings. As far as we were concerned, it was just another day at the office. Then, before you could say 'I'll have some coffee with that humble pie," the seas and wind started to build and I started to swear. Don't get me wrong. It's possible—and great fun—to surf big swells in a rowing shell. The problem was that these swells, which quickly grew from three to five feet, were coming off our beam. It was, as they say, a killer core workout. With about six seconds between swells, we had just enough time to raise our starboard oar a bit and brace ourselves as the boat tumbled down into the trough and up again. Five feet grew to eight feet and the swells started morphing into the occasional breaking wave with a side serving of white caps. More swear words ensued. I was beginning to feel like we'd rowed into that classic Japanese woodcut. And then I remembered a life lesson learned by my friends Sami and Meredith during their epic 45-day row to Hawaii. A follower had commented in response to a blog post they'd written after a particularly discouraging day. "What's the one true thing you can say to someone who is having the happiest moment in their life and someone who is at their very lowest point?" Sami and Meredith said this phrase got them through a lot and I was calling on it now as the swells grew to ten feet. At about 14 miles, my phone (safely ensconced in a waterproof cover) died. No more rowing app, no more data tracking our progress. At that very instant, Stefan and I saw a huge splash from a whale breaching in the distance. The good, the bad, all in one moment. Nothing to do but row, so we did. Fortunately Stefan's 25-year-old GPS kept us on track and we could catch a glimpse of the peninsula whenever we were on top of a swell. We'd get there. Several more swear words and a few hours later we made it, but not in three hours. Our finish was 4:08 and once again I was reminded of something else Sami and Meredith learned on their journey: "Don't make goals when you have no control of the outcome." Mother Nature holds the upper hand and she was the cook of that humble pie we were served. I won't say it was delicious, but I will say that it was all worth it. Cheers to everyone who did the 2014 Monterey Crossing. It will go down as an epic adventure for all. Huge thanks to Tom Dexel, Tim Huebner, Rod Williams, Tim Kensit, the awesome Santa Cruz Rowing Club volunteers who revived this classic race and the three escorts who braved the waters. You are the best!